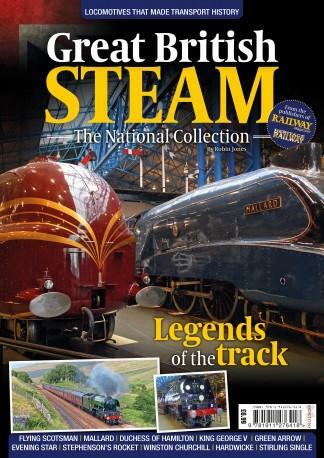 This is the story of the world’s finest collection of steam railway locomotives – legends such as Flying Scotsman, Mallard, Stephenson’s Rocket and City of Truro, which became household names for many generations, and are now owned by the public. These are the locomotives that not only shaped global transport history but steered the evolution of the modern world, shrinking continents and making rapid transit between one-time faraway places an everyday occurrence affordable to all. The National Collection was amassed largely in the face of modernisation of the British railway network, when the introduction of diesel and electric locomotives in the Fifties led to the mass withdrawal and scrapping of many classic steam locomotive types. Officialdom decreed that examples should be preserved for posterity thus creating a fantastic legacy of locomotives big and small for future generations to relish.This bookazine looks at both the big named engines and the lesser-known workhorses, which richly deserve their place alongside them, all with their own stories to tell. *Duchess of Hamilton. Stranded in the USA during the Second World War, it was saved from the scrapman by becoming a Butlin’s holiday camp exhibit. Be the first person to tell us what you think about Great British Steam: The National Collection and you'll save £2.50 on your next purchase!